Bell today announced the Official Route and National Partners for Clara’s Big Ride for Bell Let’s Talk. The Canadian Association for Suicide Prevention is partnering with the Mental Health Commission of Canada to promote World Suicide Prevention Day on September 10. Today, the Canadian Alliance on Mental Illness and Mental Health (CAMIMH) announced the five Canadians selected for the 11th annual Faces of Mental Illness campaign. Bell and Queen’s University today announced the launch of the Annual Bell Lecture on Mental Health and Anti-Stigma, an initiative aimed at raising awareness of mental health. The Canadian Alliance on Mental Illness and Mental Health (CAMIMH) is calling for nominations from the public for the 11th annual Faces of Mental Illness campaign. The Defeat Depression Campaign is getting people to take action against depression and MOVE FOR MENTAL HEALTH! Funds will increase support, training and access to the Child Psychiatry Transitional Care Program at JGH. The Canadian Alliance on Mental Illness and Mental Health Celebrates the Champions of Mental Health Awards Gala. 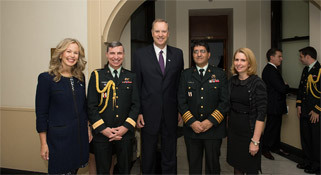 Bell Canada and the True Patriot Love Foundation today announced the launch of the Bell True Patriot Love Fund. The Canadian Alliance on Mental Illness and Mental Health Proudly Announces the 2013 Champions of Mental Health Award Winners. Québec's largest ever fundraising initiative in support of mental health. The Canadian Alliance on Mental Illness and Mental Health Seeks Nominations from the Public.